“It does not take a lot of thinking to cook a chicken; and yet we see men who, all their lives, are bad at roasting them,” wrote Vauvenargues, the French aphorist, in 1746. 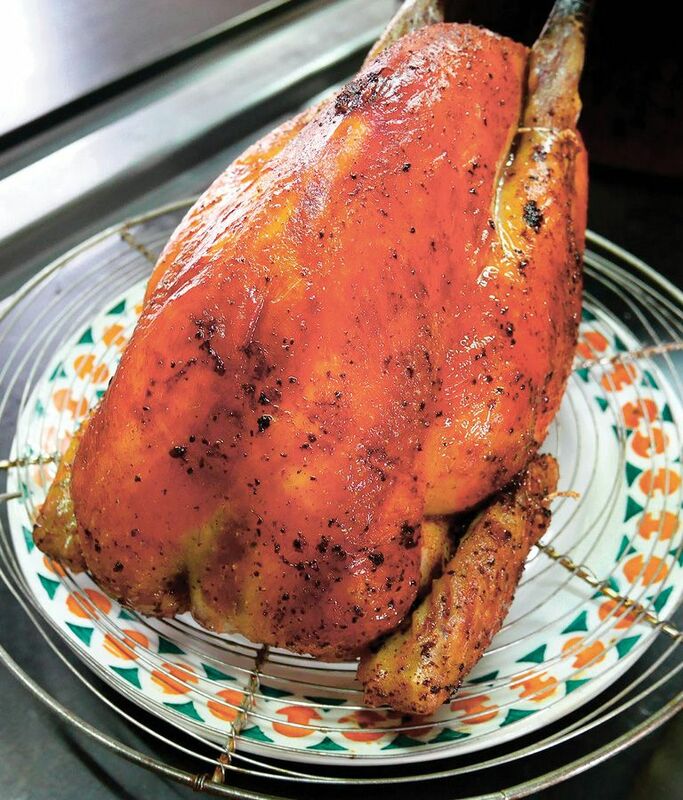 Perhaps French chefs will always debate how best to roast a chicken, said François-Régis Gaudry in Let’s Eat France! (Artisan). But certain shared beliefs have emerged: Select a well-bred chicken; let it reach room temperature before roasting; salt but don’t pepper (because cooked black pepper is bitter); and turn the chicken frequently while roasting. Below are three takes on a classic, courtesy of Frédéric Ménager, of the restaurant Ferme de la Ruchotte; Arthur Le Caisne, author of La Cuisine c’est aussi de la chimie, and chef Fabien Beaufour, of the restaurant Dyades. Place a cast-iron casserole dish in oven and preheat both to 475. Stuff a lemon, some thyme, some garlic cloves, and a tsp of coarse salt in the cavity of a 4½ lb chicken. Season the chicken all over with salt, then coat with 10 tbsp softened butter. In the oven, sear chicken on its back for 10 minutes. Turn it onto its left thigh to cook for another 10 minutes, then repeat with right thigh. Lower temperature setting to 300 and turn chicken onto its back again. Baste every 5 minutes for 30 minutes, then remove from oven and lower oven temperature to 200. Let chicken stand 30 minutes, then roast at 200 for another 10 minutes. Rest briefly before serving. Preheat oven to 275. Place 2 tbsp butter and some garlic cloves and herbs in the cavity of a 4½ lb chicken. Spread 2 tbsp of softened butter under skin of entire chicken and coat outside with olive oil. Season all over with salt. In a baking dish just slightly larger than the chicken, place bird on its side. Roast 15 minutes, turn onto other side, roast another 15 minutes, then turn breast side down. Roast another 2½ hours. Remove from oven, season with salt and pepper, and let rest 20 minutes. Make the brine: Boil 4 cups water with 2 tbsp salt, 1 cup sugar, and ¾ cup soy sauce. Add 12 cups water, 1 tsp ground black pepper, 1 lemon slice, and ½ cup chopped onion. Let cool. Submerge a 3½ lb chicken (preferably a Barbezieux) in brine 6 hours. Drain; let dry 3 hours. Place 1 tbsp rosemary, 3 bay leaves, and 1 crushed garlic clove in cavity of chicken. Mix ¼ cup olive oil with ¾ tsp each paprika and cayenne pepper; rub mixture all over skin. Let dry 1 hour. Preheat oven to 350. Roast bird on its back 20 minutes, then turn it to roast 15 minutes on one side, then 15 more on the other. Remove from oven; let rest 20 minutes.